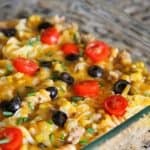 Need a quick, easy and delicious dinner idea that the whole family will enjoy and can even be used for Game Day? 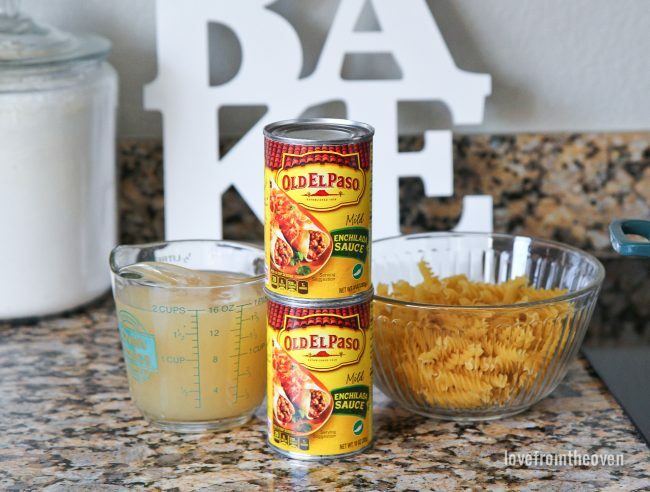 This Easy Enchilada Pasta recipe is an all time favorite of ours. 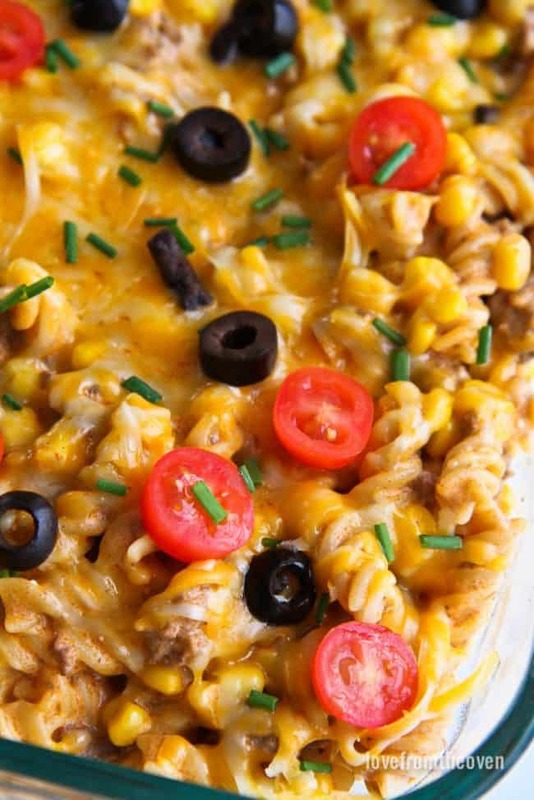 You can make the entire meal in one pot, and it’s a great way to spice up your game day! The folks at Safeway and Old El Paso™ asked me to share how I spice up game day for my family, and this recipe instantly came to mind. 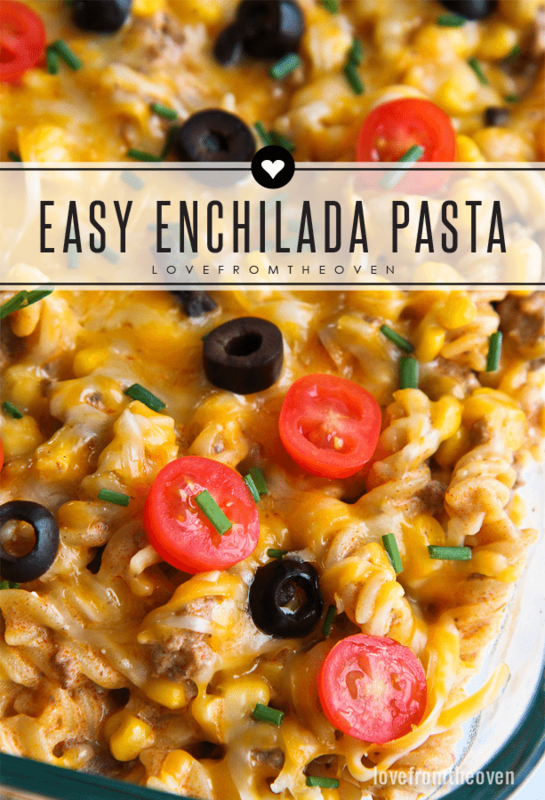 This Easy Enchilada Pasta recipe is one of those recipes that you can quickly throw together on a hectic weeknight, yet it’s so good and such a crowd pleaser that I love to use it when we entertain as well. 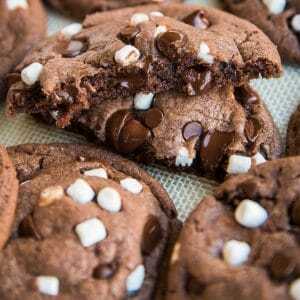 I have two super picky eaters, yet this is one of those recipes that they both love and request often. Thanks to Safeway and Old El Paso for sponsoring this post. While you see me serving this in a casserole dish, it is actually made all in one pot, and can be served right from that pot. I love not dirtying all my dishes or having three burners going on my stove. 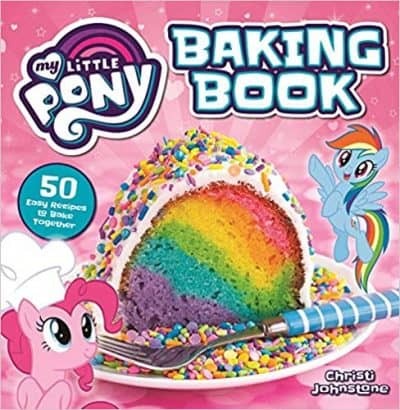 The other thing I like about this recipe is that it’s both flexible and forgiving. You can play around with the ingredients and the amounts, and it’s still going to turn out great. When I’m entertaining, I love recipes that don’t take a super sharp focus to get right. It allows me to both cook and visit, which is fantastic. 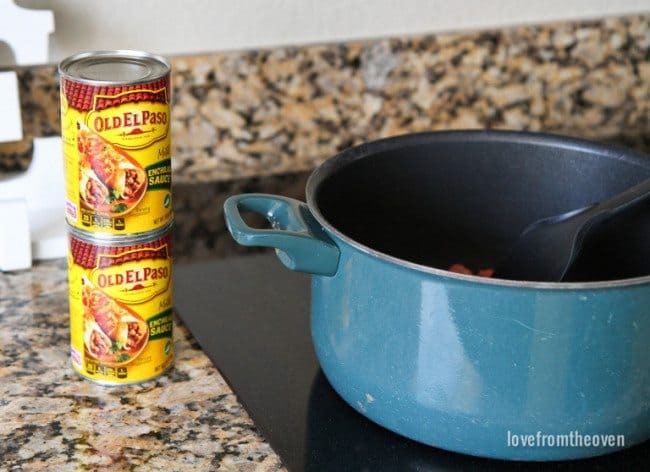 For this recipe you can use any of the Old El Paso red enchilada sauces that you prefer. I tend to go mild as my little one doesn’t like things too spicy, but if your family likes a bit more of a kick, by all means, go for it! 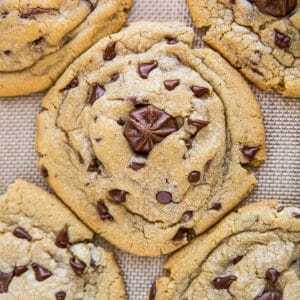 You can also completely change up this recipe and go with one of the green chile sauces. 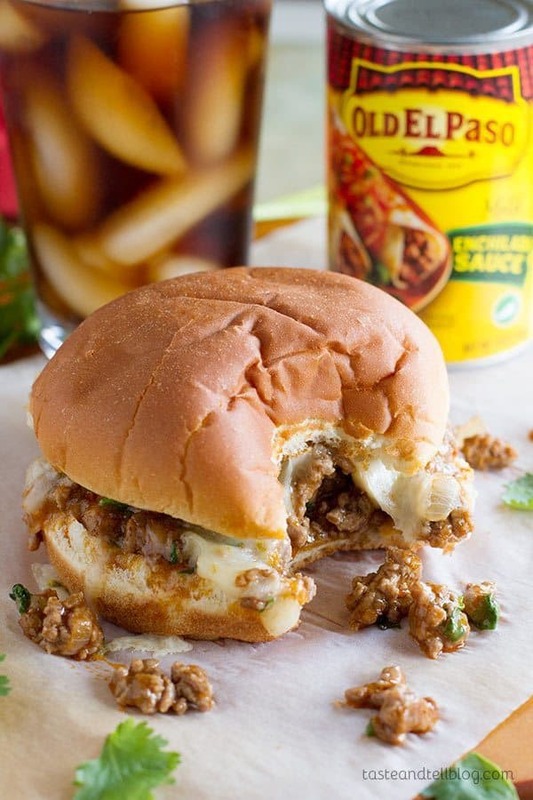 When I do that I like to use ground turkey in place of ground beef, and a Monterey Jack cheese. 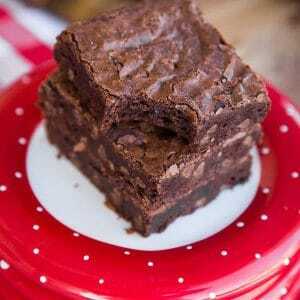 It will give you an entirely different flavor, we’ve had weeks where I’ve made both! Your ingredients for this are pretty simple. 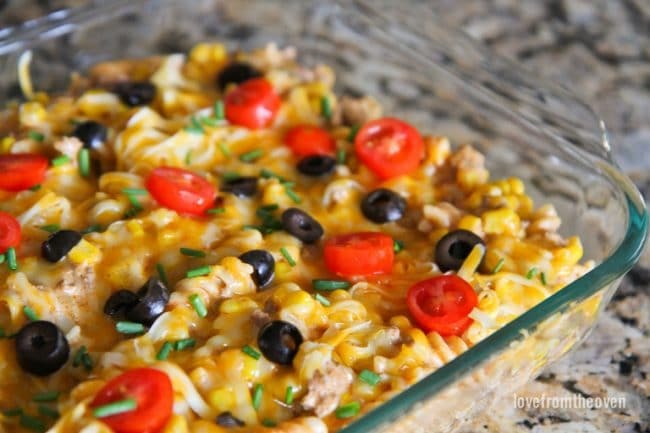 Dried pasta, ground beef, chicken (or beef) broth, Old El Paso Enchilada Sauce, cream cheese, corn, cheese and some toppings such as tomatoes, black olives, green onions, whatever you like. You start by browning your meat in a pan that will be large enough to hold the entire recipe. I use approximately a pound of ground beef, but it can be a little over or under. 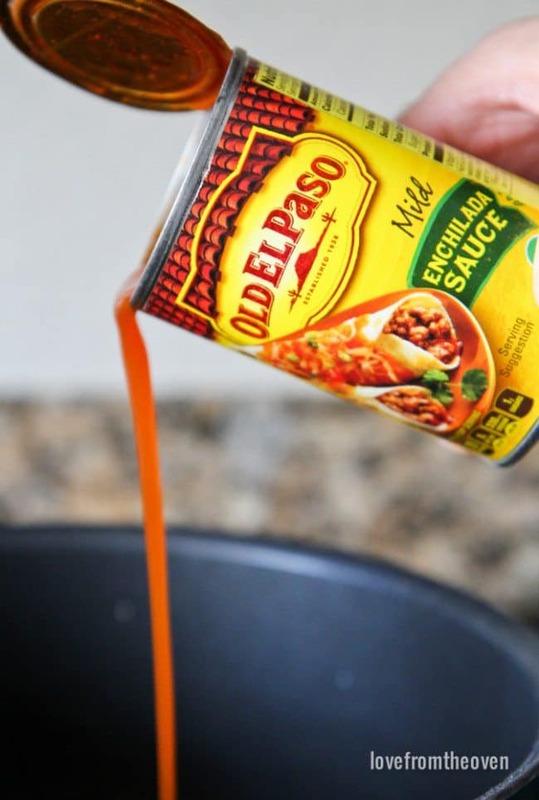 Once it has cooked, you can drain off any fat, and then add in your Old El Paso Enchilada Sauce as well as your broth. I use chicken broth because I almost always have it on hand, but you can absolutely go with a beef broth as well. And then you add your pasta. I cover my pan and let the pasta, beef, enchilada sauce and broth cook for about 10 minutes. Every pasta cooks a bit differently, so you’ll want to check your pasta starting around the seven minute mark. 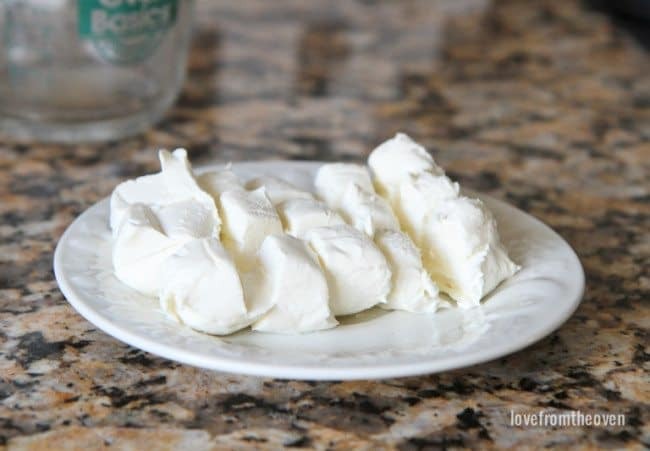 Once it starts to get close to being the texture you like (we prefer ours al dente), you’ll add in your cream cheese that has been cut into cubes and stir it well. After that has cooked for a minute or so, it’s time to add the corn. 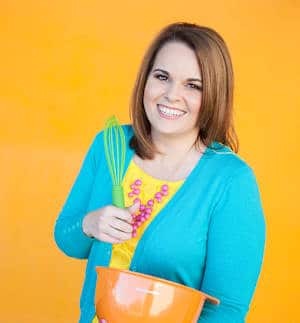 I use frozen corn and I don’t pre-cook it. 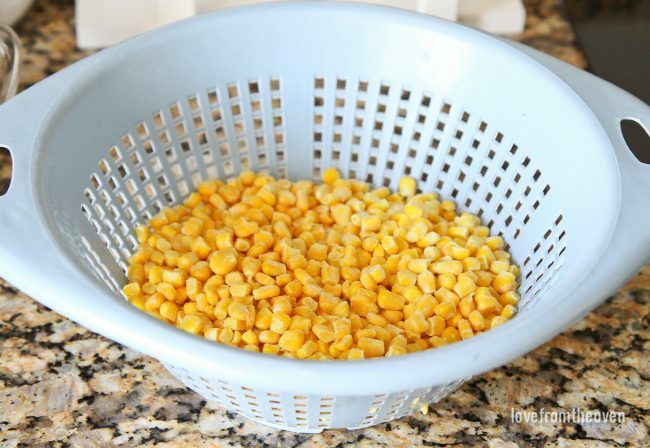 I don’t however want to add in frozen corn and cool down my entire meal, so I run the frozen corn under warm water in a strainer prior to adding it to the pot. Basically the corn is now thawed, and it just needs to heat up in the mixture. After the corn goes in I cook it for another minute or two, then top with cheese and toppings, and it’s time to serve. 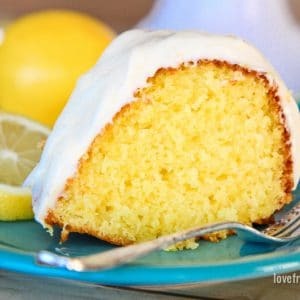 Seriously SO easy and so delicious. 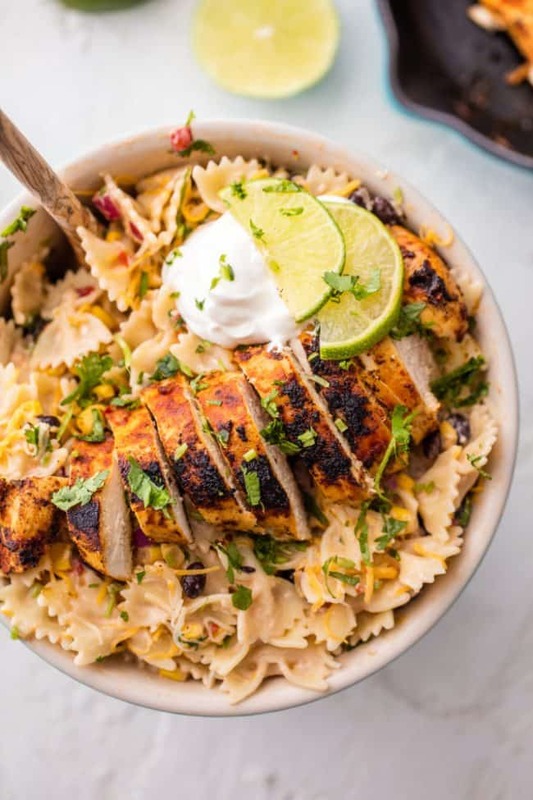 Such a great meal to share with friends and family for game day. I hope that your friends and family love this as much as we do! In a large pot or skillet (large enough to hold entire recipe), over medium heat cook, cook onions and garlic until onions are translucent. Add ground beef and cook until thoroughly browned. Once meat is browned, add enchilada sauce and broth, cover, and bring to a simmer. Cook for approximately 7-8 minutes than start checking the progress of the pasta. When pasta starts to reach al dente, add in cream cheese and stir well. Cover and allow to cook for 1-2 more minutes. Stir in corn, and cook for 1-2 minutes. When pasta is cooked how you like it, add in cheese, which can be stirred in or allowed to melt on the top. Sprinkle with any additional ingredients such as tomatoes or olives. Serve immediately. 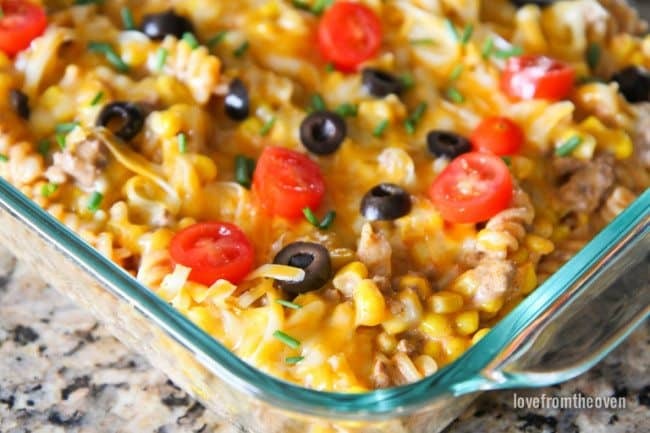 Love recipes packed full of enchilada flavor? 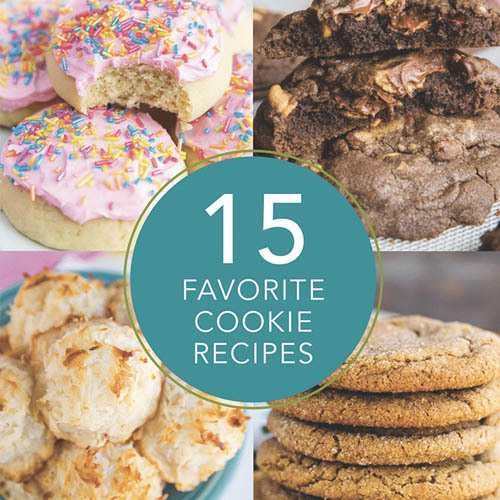 I’ve got some more recipes you’ll want to check out! 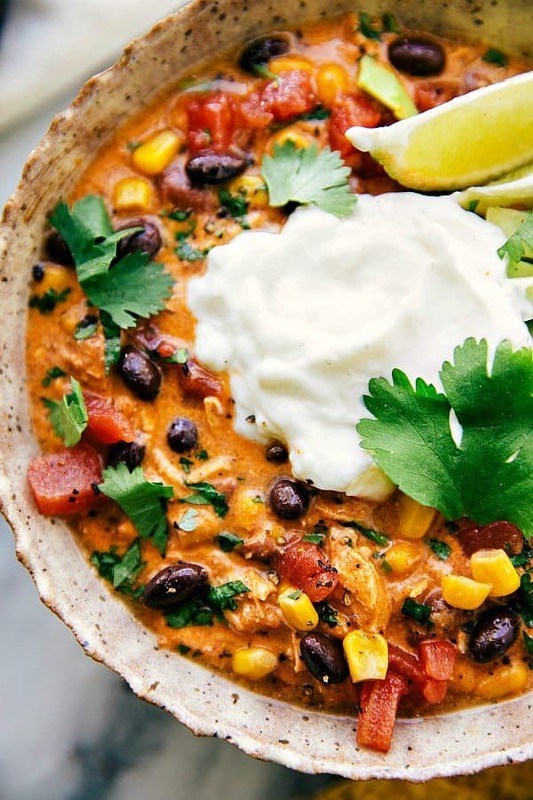 Chelsea’s Messy Apron has a great Easy Crockpot Creamy Chicken Chili recipe. 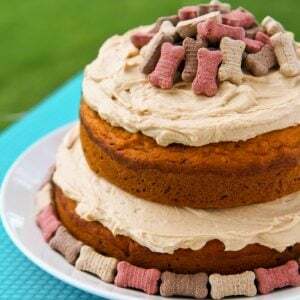 Taste & Tell has an amazing (and super creative!) 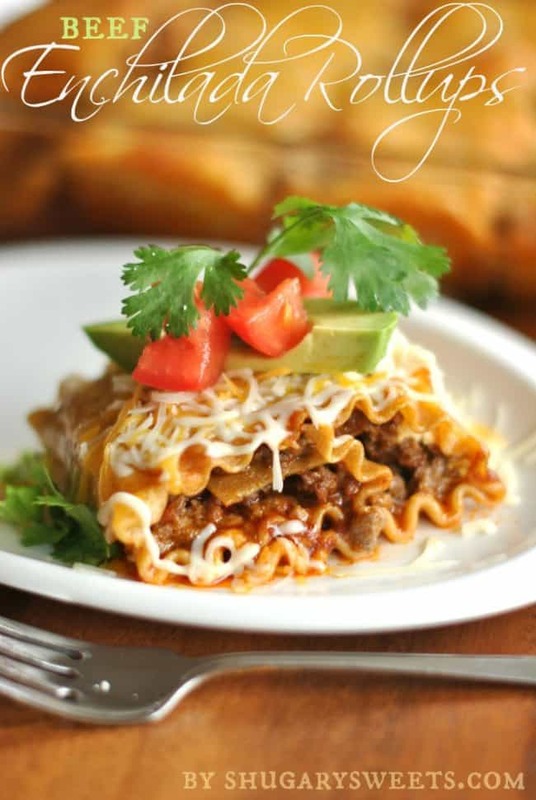 Enchilada Sloppy Joe recipe. 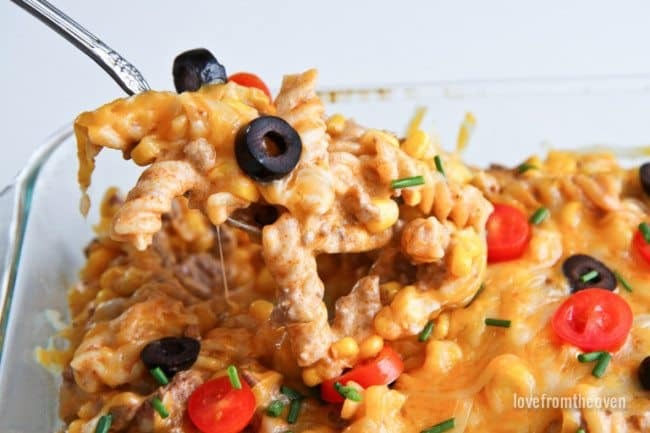 The Cookie Rookie has a fun Chicken Enchilada Pasta Salad recipe. 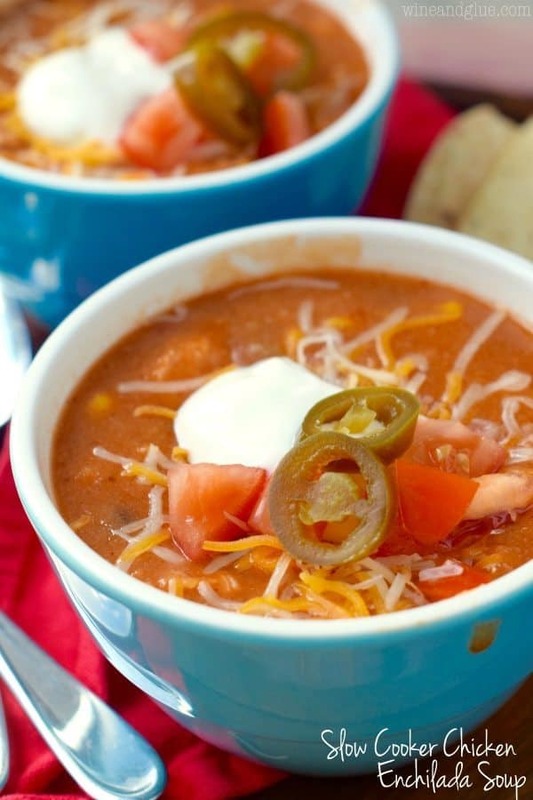 Wine and Glue has a delicious Slow Cooker Chicken Enchilada Soup recipe. Shugary Sweets has some tasty Enchilada Beef Rollups. 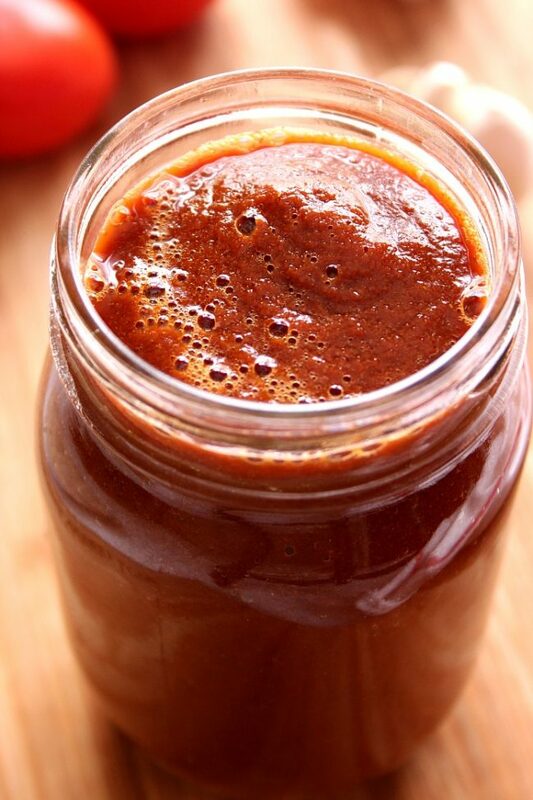 And you won’t want to miss this 5-Minute Blender Enchilada Sauce from Crunchy Creamy Sweet. Disclosure: This post was sponsored by Safeway and Old El Paso. All opinions however are mine and mine alone. 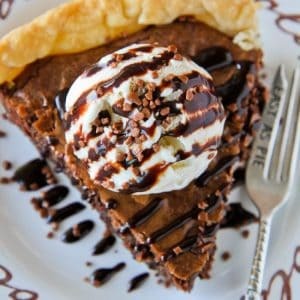 I am adding this to out menu for next week! My Hubby loves spicy pasta so this is going to be a hit! When I say I make this almost weekly, I’m not exaggerating at all! When is the pasta added exactly. It’s mentioned to check it’s progress -but when do u put it in? Sarah, after browning your ground beef, you add your enchilada sauce, chicken stock/broth and the pasta, which cooks in those liquids. Enjoy, we have this at least 2-3 times a month!